NORTH DINWIDDIE, Va. (October 20, 2017): The Professional Drag Racers Association has reached the end of its fourth season. This weekend’s World Finals at Virginia Motorsports Park is every team’s last chance to make their mark on the season. Trevor Eman and the Aruba.com Extreme Pro Stock Mustang currently hold the number three spot in points. 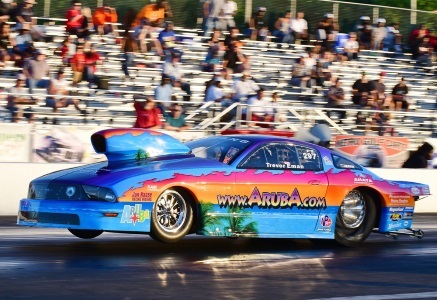 It’s been a great season for Team Aruba with a win at Darlington Dragway, followed by a runner up at Maryland International Raceway. They would like nothing more than to cap the season off with another win. “We’re excited to be back here in Virginia chasing another 660 Man,” Eman said, referring to the PDRA national event trophies. “We would love to end our season with another win and keep up our standings in the points. The entire PDRA World Finals is broadcasting live on www.SpeedVideo.com. Qualifying begins on Friday. Eliminations will be run on Saturday.